Key stakeholders in Africa’s agricultural sector have identified partnerships for sustainable agricultural technology delivery as a critical factor in Africa’s quest to feed Africa. DG Nteranya Sanginga being congratulated by AGRF participants. This came out strongly at a breakfast session that heralded the presidential summit of the 2018 African Green Revolution Forum (AGRF) in Kigali, Rwanda’s capital city. Organized by the ClearingHouse of the Technologies for African Agricultural Transformation (TAAT), an initiative of the African Development Bank’s Feed Africa Strategy that aims to achieve major agricultural transformation in Africa, the session had in attendance, African agriculture ministers, scientists, representatives of multilateral development banks, donor partners, and the private sector. Dr Mpoko Bokanga, Head of the TAAT ClearingHouse, in his opening statements, traced the program’s history to the October 2015 Dakar High Level Conference on Africa Agricultural Transformation Agenda, which led to the adoption of 4 goals and 18 action points to transform African agriculture. 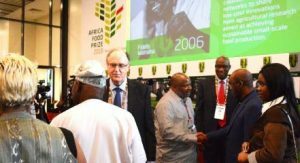 “These partnerships will not only provide access to expertise required to design, implement, and monitor the progress of crops, animals, and aquaculture, they will also contribute to ending extreme poverty by eliminating hunger and malnutrition and making Africa a net exporter of agricultural commodities,” Bokanga said. TAAT, according to Bokanga, is not an addition to Africa’s long list of agricultural initiatives but an innovative program that serves as a clearinghouse for sustainable agricultural technology delivery. Through its components, the program will promote an enabling environment for technology adoption; establish a regional technology delivery infrastructure to accelerate delivery; and raise Africa’s agricultural productivity by deploying proven agricultural technologies at the agroecological and country levels in strengthened agricultural value chains. “Togo has benefited from several of IITA path-breaking agricultural solutions and it is our hope that TAAT will not be any different,” Agadazi added. Hon. Joseph Mwanamvekha, Malawian Minister of Agriculture, Irrigation and Water Development, commended the partnership between IITA as the executing agency and the over 10 research institutes and centers driving the implementation of the TAAT program. Also underscoring the imperatives of partnerships for sustainable agricultural technology at the breakfast session were representatives of the International Fund for Agricultural Development (IFAD), the Alliance for a Green Revolution in Africa (AGRA), and IITA.